Ricavision develops consumer electronic products with embedded Microsoft technology for the OEM, retail, custom integrators and hospitality markets. 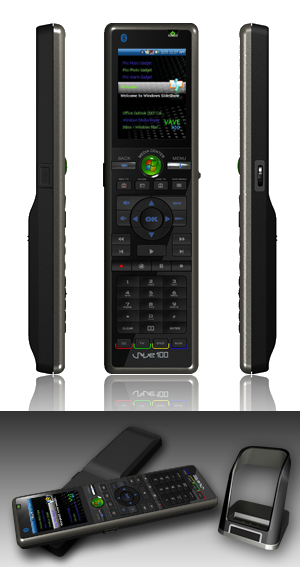 The VAVE100 Universal remote control has a 2.4 inch color QVGA LCD display, features Class 1 SPP/A2DP Bluetooth and is upgradable through the built-in mini USB. It is combined with Microsoft SideShow to deliver digital information to your fingertips, and is due to be available in Summer 2008. The remote will control up to 20 different devices and has a built-in database of over 1500 brand names to simplify setting up the device. The device has a dedicated button to activate and control Windows Media Center from Windows Vista. Windows SideShow is technology from Microsoft that uses gadgets to extend information from your computer to other devices. Gadgets can run on a Windows SideShow compatible device (such as the VAVE100 ) and update that device with information from your computer. This enables you to view News Headlines, Weather details, email etc. directly on the VAVE100. Currently intended for testing purposes only, it is available for download from the Microsoft Download Center (although Microsoft does not recommend installing this software on primary or mission critical systems and recommends that you have a backup of your data prior to installing any pre-release software). This service pack is a rollup of all previously released updates for the Windows XP operating system. Although it contains a small number of new enhancements it will not significantly change the customers experience, according to details released in the document "Overview of Windows XP Service Pack 3"
Remind me again, Why should I upgrade to Windows Vista? Microsoft recently announced their intention to purchase Softricity. Microsoft's current virtualization software is designed to run multiple instances of Windows simultaneously. Softricity's tools let companies virtualize applications that run on Windows, such as Microsoft Office or other business applications, so that programs can be managed centrally and delivered over a network to desktop machines. With Softgrid, from Softricity, Microsoft can offer network-based applications that execute in Vista on the desktop, which means they can tap into all the advanced graphics and other performance benefits of Vista while still having all the connectivity-led advantages that browser-based applications enjoy. Microsoft needs to develop its Application Virtualisation strategy further to fend off competion from the likes of Google, and this acquistion will assist in that process. Microsoft plans to release Vista to business customers through its volume licensing program in November but machines with pre-installed consumer versions will not be generally available until January 2007. Specific reasons have not been given for the delay although it is possibly due to efforts to improve security in the new system. No details have been given about pricing for the different versions.